Hydrail is the generic (not capitalized) adjective term describing all forms of rail vehicles, large or small, which use on-board hydrogen as a source of energy to power the traction motors, or the auxiliaries, or both. Hydrail vehicles convert the chemical energy of hydrogen to mechanical energy, either by burning hydrogen in a hydrogen internal combustion engine vehicle, or by reacting hydrogen with oxygen in a fuel cell to run electric motors. Widespread use of hydrogen for fueling rail transportation is a basic element of the proposed hydrogen economy. The term is used extensively by research scholars and technicians around the world. Hydrail vehicles are usually hybrid vehicles with renewable energy storage, such as batteries or super capacitors, for regenerative braking, improving efficiency and lowering the amount of hydrogen storage required. Potential hydrail applications include all types of rail transport: commuter rail; passenger rail; freight rail; light rail; rail rapid transit; mine railways; industrial railway systems; trams; and special rail rides at parks and museums. The term hydrail was first mentioned on August 22, 2003, in an invited presentation at the US Department of Transportation's Volpe Transportations Systems Center in Cambridge, MA. There, Stan Thompson, a former futurist and strategic planner at US telecoms company AT&T gave a presentation entitled the Mooresville Hydrail Initiative. However, according to authors Stan Thompson and Jim Bowman, the term first appeared in print on 17 February 2004 in the International Journal of Hydrogen Energy as a search engine target word to enable scholars and technicians around the world working in the hydrogen rail area to more easily publish and locate all work produced within the discipline. Since 2005, annual International Hydrail Conferences have been held. Organised by Appalachian State University and the Mooresville South Iredell Chamber of Commerce in conjunction with universities and other entities, the Conferences have the aim of bringing together scientists, engineers, business leaders, industrial experts, and operators working or using the technology around the world in order to expedite deployment of the technology for environmental, climate, energy security and economic development reasons. Presenters at these conferences have included national and state/provincial agencies from the US, Austria, Canada, China, Denmark, the EU, Germany, France, Italy, Japan, Korea, Russia, Turkey, the United Kingdom, the European Union and the United Nations (UNIDO-ICHET). In its early years, these conferences were largely dominated by academic fields; however, by 2013, an increasing number of businesses and industrial figures have reportedly been in attendance. During the 2010s, both fuel cells and hydrogen generation equipment have been taken up by several transport operators across various countries, such as China, Germany, Japan, Taiwan, the United Kingdom, and the United States. Many of the same technologies that can be applied to hydrail vehicles can be applied to other forms of transport as well, such as road vehicles. Hydrogen is a common and easy to find element, being that each molecule of water has two atoms of hydrogen for every oxygen atom present. Hydrogen can be separated from water via several means, including steam reforming (normally involving the use of fossil fuels) and electrolysis (which requires large amounts of electricity). Once isolated, hydrogen can serve as a form of fuel. It has been proposed that hydrogen for fuelling hydrail vehicles can be produced in individual maintenance depots, requiring only a steady supply of electricity and water; it can then be pumped into pressurised tanks upon the vehicle. The development of lighter and more capable fuel cells has increased the viability of hydrogen-powered vehicles. According to Canadian company Hydrogenics, in 2001, its 25 kW fuel cell weighed 290 kg and had an efficiency ranging between 38 and 45 per cent; however, by 2017, they were producing more powerful and compact fuel cells weighing 72 kg and with an efficiency between 48 and 55 per cent, a roughly fivefold increase in energy density. According to Rail Engineer, the use of hydrogen propulsion on certain types of trains, such as freight locomotives or high-speed trains, is less attractive and more challenging than on lower-powered applications, such as shunting locomotives and multiple units. The publication also observes that pressure to cut emissions within the railway industry is likely to play a role in stimulating demand for the uptake of hydrail. A key technology of a typical hydrogen propulsion system is the fuel cell. This device converts the chemical energy contained within the hydrogen in order to generate electricity, as well as water and heat. As such, a fuel cell would operate in a manner that is essentially inverse to the electrolysis process used to create the fuel; consuming pure hydrogen to produce electricity rather than consuming electrical energy to produce hydrogen, albeit incurring some level of energy losses in the exchange. Reportedly, the efficiency of converting electricity to hydrogen and back again is just beneath 30 per cent, roughly similar to contemporary diesel engines but less than conventional electric traction using overhead catenary wires. The electricity produced by the onboard fuel cell would be fed into a motor to propel the train. Railway industrial publication Railway Engineer has theorised that the expanding prevalence of wind power has led to some countries having surpluses of electrical energy during nighttime hours, and that this trend could offer a means of low-cost and highly available energy with which hydrogen could be conveniently produced via electrolysis. In this manner, it is believed that the production of hydrogen using off-peak electricity available from countries' electrical grids shall likely be one of the most economic practices available. As of January 2017, hydrogen produced via electrolysis commonly costs roughly the same as natural gas and almost double that of diesel fuel; however, unlike either of these fossil-based fuels, hydrogen propulsion produces zero emissions. According to Rail Engineer and Alstom, a 10MW wind farm is capable of comfortably producing 2.5 tonnes of hydrogen per day; enough to power a fleet of 14 iLint trains over a distance of 600 km per day. Reportedly, as of January 2017, production of hydrogen worldwide has been expanding in quantity and availability, increasing its attractiveness as a fuel. The need to build up a capable distribution network for hydrogen, which in turn requires substantial investments to be made, is likely to play a role in restraining the growth of hydrail at least in the short term. It was observed by Railway Technology that the rail industry has been historically slow to adopt new technologies and relatively conservative in outlook; however, a successful large-scale deployment of this technology by an early adopter may be decisive in overcoming attitudes of reluctance and traditionalism. Additionally, there could be significant benefits to transitioning from diesel to hydrail propulsion. According to the results of a study performed by a consortium of Hitachi Rail Europe, the University of Birmingham, and Fuel Cell Systems Ltd, hydrail vehicles in the form of re-powered diesel multiple units could be capable of generating significant energy consumption reductions; reportedly, their model indicated a saving of up to 52 per cent on the Norwich to Sheringham line over conventional traction. A hydrolley is a term for a streetcar or tram (trolley) powered by hydrail technology. The term (for hydrogen trolley) was coined at the Fourth International Hydrail Conference, Valencia, Spain, in 2008, as a research-simplifying search engine target word. Onboard hydrogen-derived power eliminates the need for overhead trolley arms and track electrification, greatly reducing construction cost, reducing visual pollution and eliminating the maintenance expense of track electrification. The term 'hydrolley' is preferred to 'hydrail light rail' or other combinations which might connote external electrification. In 2002, the first 3.6 tonne, 17 kW, hydrogen-powered mining locomotive powered by Nuvera Fuel Cells for Placer Dome was demonstrated in Val-d'Or, Quebec. In April 2006, the world's first hydrail railcar, which was developed by East Japan Railway Company, was developed. In October 2006, the Railway Technical Research Institute in Japan conducted tests on a fuel cell hydrail, a 70-ton intercity train powered by Nuvera Fuel Cells. In April 2007, the mini-hydrail from the Taiwan National Science and Technology Museum and Taiwan Fuel Cell Partnership combination made its first educational ride. In 2007, the Railway Technical Research Institute in Japan built two 62 ton passenger cars, each with a 450 kW PEM fuel cell and a 150 kW battery. In 2008, the East Japan Railway Company in Japan tested its experimental "NE Train" hybrid train fitted with two 65 kW PEM fuel cells and 19 kWh lithium ion batteries for a short period in the Nagano area. In 2009, BNSF Railway unveiled its Vehicle Projects HH20B, a switcher-locomotive powered by hydrogen fuel cells and developed in conjunction with the US Army Corps of Engineers and Vehicle Projects Inc. It reportedly performed its first run during 2010. In 2010, a 357-kilometre (222 mi) high-speed hydrail line was proposed in Indonesia. The rail link, now under feasibility study, would connect several cities in Java with a hydrogen-powered maglev system. In 2011, FEVE and the University of Valladolid (CIDAUT) launched the FC Tram H2 Project in Asturias using a converted FABIOLOS series 3400 from SNCV. It can carry up to 30 passengers with a maximum speed of 20 km/h. 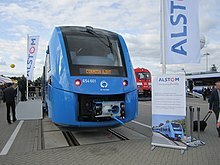 During 2012, the Hydrogen Train Project in Denmark commenced its efforts to develop and build Europe's first hydrogen powered train using hydrogen in an internal combustion engine. In 2012, the mini-hydrail Hydrogen Pioneer Train from the University of Birmingham, a scaled powertrain for configuration testing. Between 2012 and 2014, testing was conducted on the hydrail concept in China. In November 2010, Southwest Jiaotong University demonstrated their first hydrail prototype. During 2012, Anglo American Platinum (Amplats) in South Africa and Vehicle Projects Inc. launched 5 PEMFC Trident new era locomotives at the Dishaba mine with reversible metal-hydride storage for testing. In 2014, the German states of Lower Saxony, North Rhine-Westphalia, Baden-Württemberg and the Public Transportation Authorities of Hesse signed a letter of intent with Alstom Transport for trials with 2 fuel cell Alstom Coradia trains by 2018. During 2015, the University of Warwick started work on a hydrogen powered locomotive. That same year, the Downtown Oranjestad streetcar in Aruba went into service; the Downtown Dubai Trolley Project is intended to go into service around Burj Khalifa and the Dubai Mall in Dubai. In 2015, CSR Sifang Co Ltd. showed its first 380-passenger tram in Qingdao, China. During September 2016, Alstom revealed their newly developed iLint train, produced at their factory in Salzgitter. In November 2017, the state of Lower Saxony's local transportation authority ordered an initial fleet of 14 iLints. Testing and approval by the German Federal Railway Authority Eisenbahn-Bundesamt commenced in late 2016. 2016 - CRRC TRC(Tangshan) developed the world's first commercial fuel cell hybrid tram and completed its first test run on Nanhu industrial rourism demonstration operation in 2017. 2018 - A pair of prototype Ilint trains are to enter regular revenue service on the Buxtehude–Bremervörde–Bremerhaven–Cuxhaven region. Schleswig-Holstein intends to electrify the entirety of its 1,100 km network using a fleet of 60 iLint hydrail vehicles by 2025. As of January 2018, all vehicles are planned to be maintained at a depot in Bremervorde, which will be the world's first hydrogen train refuelling depot; hydrogen is to be generated on-site using local wind turbines. In September 2017, Alstom proposed a trial of Hydrogen Fuel Cell powered train on the new Liverpool to Chester line in England, which is scheduled for opening in December 2018. Alstom have a new facility in Halebank on the edge of Liverpool adjacent to the line, with hydrogen available from the nearby Stanlow Refinery. In March 2018, the Sarawak state government in Malaysia proposed that the Kuching Light Rail Transit system will be powered using hydrogen fuel cells and is expected to be completed by 2024. In September 2018, The world's first commercial hydrogen-powered passenger train enters service in Lower Saxony, Germany. The Alstom developed train uses a hydrogen fuel cell which emits no carbon dioxide. ^ Graham-Rowe, D. (2008). "Do the locomotion". Nature. 454 (7208): 1036–7. doi:10.1038/4541036a. PMID 18756218. ^ Minkel, J. R. (2006). "A Smashing Bad Time for the United States". IEEE Spectrum. 43: 12. doi:10.1109/MSPEC.2006.1665046. ^ Jones, W. D. (2009). "Fuel cells could power a streetcar revival". IEEE Spectrum. 46: 15. doi:10.1109/MSPEC.2009.5210050. ^ Jones, W. D. (2006). "Hydrogen on Track". IEEE Spectrum. 43: 10. doi:10.1109/MSPEC.2006.1665045. ^ Delucchi, M. A.; Jacobson, M. Z. (2010). "Providing all global energy with wind, water, and solar power, Part II: Reliability, system and transmission costs, and policies". Energy Policy. 39 (3): 1170–1190. doi:10.1016/j.enpol.2010.11.045. ^ Marin, G. D.; Naterer, G. F.; Gabriel, K. (2010). "Rail transportation by hydrogen vs. Electrification – Case study for Ontario, Canada, II: Energy supply and distribution". International Journal of Hydrogen Energy. 35: 6097. doi:10.1016/j.ijhydene.2010.03.095. ^ a b c d Grey, Eva. "German state thrusts hydrogen-powered hydrail into the spotlight." railway-technology.com, 21 June 2016. ^ a b c d e f g h i j k l m n o p q r s t "Hydrail comes of age." railengineer.uk, 5 January 2018. ^ "Fuel-Cell-Powered Mine Locomotive." Sandia National Laboratories, 2004. ^ "Development of the World's First Fuel Cell Hybrid Railcar." East Japan Railway Company, 11 April 2006. Accessed 6 Feb 2011. ^ "Japanese fuel cell rail vehicle in running tests". Fuel Cells Bulletin. 2006 (12): 2–3. 2006. doi:10.1016/S1464-2859(06)71254-8. ISSN 1464-2859. ^ "World's first hydrogen fuel train tested in Taiwan." People's Daily, 13 April 2007. ^ Adamson, Kerry-Ann "2007 Niche Transport Survey." July 2007. Archived 11 July 2011 at the Wayback Machine (PDF). Fuel Cell Today. ^ "BNSF Railway and Vehicle Projects Demonstrate Experimental Hydrogen-Fuel-Cell Switch Locomotive." BNSF Railway, 29 June 2009. ^ "Hydrail: Preliminary Proposal". interstatetraveler.us. ^ "Indonesia high speed hydrogen train feasibility study". The Hydrogen Journal. 13 Jan 2010. Retrieved 25 March 2011. ^ Adamrah, Mustaqim (8 Jan 2010). "RI could have a super high speed train as early as 2012". Jakarta Post. Retrieved 26 March 2011. ^ "FEVE hydrogen tram." vialibre-ffe.com. ^ "Europe's first hydrogen powered train." The Hydrogen Train Project. ^ "Denmark wants Europe's first hydrogen train." trb.org. ^ Hoffrichter, Andreas; Fisher, Peter; Tutcher, Jonathan; Hillmansen, Stuart; Roberts, Clive (2014). "Performance evaluation of the hydrogen-powered prototype locomotive 'Hydrogen Pioneer'". Journal of Power Sources. 250: 120–127. doi:10.1016/j.jpowsour.2013.10.134. ISSN 0378-7753. ^ "First UK hydrogen train takes passengers for a ride." New Scientist, July 2012. ^ Peng, Fei; Chen, WeiRong; Liu, Zhixiang; Li, Qi; Dai, Chaohua (2014). "System integration of China's first proton exchange membrane fuel cell locomotive". International Journal of Hydrogen Energy. 39 (25): 13886–13893. doi:10.1016/j.ijhydene.2014.01.166. ISSN 0360-3199. ^ "China introduces first light-rail train with new-energy fuel cells." People's Daily, 29 November 2010. ^ "Partnership to produce five fuel cell mine locomotives." fuelcelltoday.com, February 2012. ^ "Alstom to develop a new emission-free train for passengers in Germany." Alstom", September 2014. ^ "Powered future starts in trams, not cars." Bloomberg, 25 March 2015. ^ Doll, Von Nikolaus. "Erster Wasserstoff-Zug der Welt fährt in Deutschland." welt.de, 20 September 2016. ^ "Sarawak's LRT to use hydrogen fuel cell trains". The Star. 30 March 2018. Retrieved 24 June 2018. ^ "Hydrogen fuel cell train to enter service". NHK World - Japan. 16 September 2018. Retrieved 18 September 2018. Wikimedia Commons has media related to Hydrail. This page was last edited on 18 April 2019, at 00:22 (UTC).